Krugman: 'I didn't mean that kind of stimulus!' Mickey Kaus catches Professor Krugman in an inconsistency. From Paul Krugman's New York Times op-ed column: "Isn't keeping taxes for the affluent low also a form of stimulus? Not so you'd notice. When we save a schoolteacher's job, that unambiguously aids employment; when we give millionaires more money instead, there's a good chance that most of that money will just sit idle." March 10, 2010 New Yorker profile by Larissa MacFarquhar: "during the primary campaign Krugman was very critical of Barack Obama. He was critical chiefly because, of the three main candidates, Obama seemed to him the most conservative (his health plan, for instance, didn’t mandate universal coverage), but it wasn’t just his policies that Krugman objected to. He couldn’t stand all the feel-good stuff about hope and dialogue and reconciliation. He hated that Obama was out there saying nice things about Reagan when what Democrats needed to do most was debunk the persistent myth that Reaganomics had been good for America. 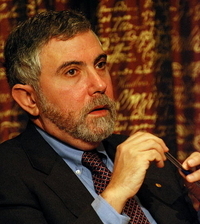 Nobel prizewinning economist and New York Times columnist Paul Krugman has a condominium in St. Croix, a large house in Princeton, N.J., and an apartment in New York. His wife, who edits his writing, "was so upset when Reagan was elected that she moved to England." e's a science fiction fan with two cats and no children. He "pulled out of the stock market ten years ago and never went back," though he does hold some Ford Motor bonds. This all is told in a New Yorker magazine profile. President Obama's second Inaugural Address offered a lot for progressives to like. There was the spirited defense of gay rights; there was the equally spirited defense of the role of government, and, in particular, of the safety net provided by Medicare, Medicaid and Social Security. But arguably the most encouraging thing of all was what he didn't say: He barely mentioned the budget deficit. Mr. Obama's clearly deliberate neglect of Washington's favorite obsession was just the latest sign that the self-styled deficit hawks — better described as deficit scolds — are losing their hold over political discourse. And that's a very good thing. I think it's important to understand the extent to which leading Republicans live in an intellectual bubble. They get their news from Fox and other captive media, they get their policy analysis from billionaire-financed right-wing think tanks, and they're often blissfully unaware both of contrary evidence and of how their positions sound to outsiders. There was, however, one piece of the reform that was a shining example of how to do it right: the creation of a Consumer Financial Protection Bureau, a stand-alone agency with its own funding, charged with protecting consumers against financial fraud and abuse. What Republicans are demanding, basically, is that the protection bureau lose its independence…. they also want to take away its guaranteed funding, opening it to interest-group pressure. "A good tax policy obeys the broad principles developed by fiscal experts over the years—for example, neutrality between alternative investments, low marginal rates, and minimal discrimination between current and future consumption." — Paul Krugman. Paul Krugman's column today offers the Nobel laureate economist's explanation for the slow economic recovery: "Right now Washington is focused on the idiocy of the sequester, but this is only the latest episode in an unprecedented run of declines in public employment and government purchases that have crippled our economy's recovery." Paul Krugman has a column under the headline "Marches of Folly" that likens concern about the deficit to the concern about Iraq's weapons of mass destruction (a concern he claims was unwarranted). He acknowledges, "I don't want to push the analogy too far...these days dissenters don't operate in the atmosphere of menace, the sense that raising doubts could have devastating personal and career consequences, that was so pervasive in 2002 and 2003." Paul Krugman has a column declaring that "Right now, the bad old days when it wasn't that easy to move lots of money across borders are looking pretty good." "Unrestricted movement of capital is looking more and more like a failed experiment," he writes, warning of how foreign money can feed a bubble and then lead to a "nasty hangover" after the bubble bursts. Professor Krugman may want to be a little more aware of his own situation; according to the latest proxy statement from the New York Times Company, 17% of that firm's outstanding Class A stock is owned by Mexican billionaire Carlos Slim Helu, and an additional 7.8% is owned by Contrarius Investment Management Limited, which is based in Jersey in the Channel Islands. You don't have to be a civil engineer to realize that America needs more and better infrastructure, but the latest "report card" from the American Society of Civil Engineers — with its tally of deficient dams, bridges, and more, and its overall grade of D+ — still makes startling and depressing reading. And right now — with vast numbers of unemployed construction workers and vast amounts of cash sitting idle — would be a great time to rebuild our infrastructure. Yet public investment has actually plunged since the slump began. Or what about investing in our young? We're cutting back there, too, having laid off hundreds of thousands of schoolteachers and slashed the aid that used to make college affordable for children of less-affluent families. I'm not suggesting everything in California is just fine. Unemployment — especially long-term unemployment — remains very high. California's longer-term economic growth has slowed, too, mainly because the state's limited supply of buildable land means high housing prices, bringing an era of rapid population growth to an end. (Did you know that metropolitan Los Angeles has a higher population density than metropolitan New York?) Last but not least, decades of political paralysis have degraded the state's once-superb public education system. So there are plenty of problems. Mr. Ghayad then did an experiment, sending out résumés describing the qualifications and employment history of 4,800 fictitious workers. Who got called back? The answer was that workers who reported having been unemployed for six months or more got very few callbacks, even when all their other qualifications were better than those of workers who did attract employer interest. So we are indeed creating a permanent class of jobless Americans. And let's be clear: this is a policy decision. The main reason our economic recovery has been so weak is that, spooked by fear-mongering over debt, we've been doing exactly what basic macroeconomics says you shouldn't do — cutting government spending in the face of a depressed economy. A column by Paul Krugman criticizes a New York Sun editorial. It's nice to see the New York Sun setting the agenda of the Nobel laureate New York Times columnist, but the Times column has some significant problems. For one thing, it accuses the Sun of "sexism" and "raw mysogyny" when it was the Times itself that, before the Sun did, raised in a front-page news article the issue of Janet Yellin's gender. But the more substantive issue seems to be what Professor Krugman writes when he says the Sun editorial "took it for granted that the Fed has been following disastrously inflationary monetary policies for years, even though actual inflation is at a 50-year low....The people shouting that the Fed is 'debasing the dollar' have been warning of runaway inflation any day now for almost five years, and they have been wrong every step of the way." Harvard economist Greg Mankiw catches Times columnist Paul Krugman making a claim about income inequality leading to higher mortality and worse health and finds that the claim is unsupported by the article that Professor Krugman links to as evidence. Nate Silver's website FiveThirtyEight.com has a pretty funny analysis about how Paul Krugman's view of FiveThirtyEight has changed substantially in a negative direction since FiveThirtyEight left the New York Times. Why have the Canadian banks fared better than American or British ones in the financial crisis? New York Times columnist Paul Krugman asks and answers the question in this morning's column: "Consider the counterexample of Canada — a mostly English-speaking country, every bit as much in the American cultural orbit as Britain, but one where Reagan/Thatcher-type financial deregulation never took hold. Sure enough, Canadian banks have been a pillar of stability in the crisis." Keith Hennessey has a really wonderful response to Paul Krugman's New York Times column from yesterday on taxes. The American Thinker's Richard Baehr also takes on Professor Krugman on some of the factual points in an article that initially struck me as having an inappropriately and gratingly screechy tone but that upon reflection I realized is probably intended as a satire of Professor Krugman's own tactic of accusing those who disagree with him of being liars. Thanks to the reader-participant-community member-watchdog-content co-creator who sent the American Thinker piece. The Hennessey piece came from the morning e-mail of Mr. Hennessey's Economic Policies for the 21st Century group. Wait, you say: won't raising taxes reduce incentives to work and create wealth? Yes, it will (although such effects are greatly exaggerated in our political discourse.) But means-testing benefits does the same thing. Conservative economists love to point out that means-tested programs like food stamps in effect create high marginal tax rates for low-income families, since they lose benefits if they work and earn more. Well, means-testing Medicare would do the same thing: your reward for a life of hard work and accumulation will be higher copays and deductibles....What we need is actual control of health costs. Means-testing of Medicare is just a badly designed, unfair form of taxation. The New York Times's Nobel laureate columnist, Paul Krugman, greeted the tenth anniversary of September 11 with a blog post contending, "The memory of 9/11 has been irrevocably poisoned; it has become an occasion for shame. And in its heart, the nation knows it." He concluded, "I'm not going to allow comments on this post, for obvious reasons."